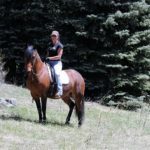 In an area full of interesting people with fascinating stories, Helen Mleynek of Elk Ridge Ranch is no exception in our horse community. Although she has lived in Colorado for over 50 years, her Australian accent and ingenuity remains strong. Helen was born in Southern Australia. While her father was an engineer in the city of Adelaide, his family were farmers. She began riding at the age of 8 and by 15 she was the head wrangler of the pony rides at the Adelaide Children’s Zoo. Helens path to Colorado began in 1965 when she met who would become her husband on a passenger liner traveling from Fremantle, Western Australia to Genoa, Italy. He left the ship in Singapore, but they met again when she was traveling across the United States heading back to Australia. Several weeks later he went to Australia, married Helen and they settled in Colorado in 1966. They purchased a 200 acre farm in Longmont where Helen raised black Arabians. By 1973 they were tired of the “flat land” and found the ranch off of Buffalo Park Road which Helen still calls home. 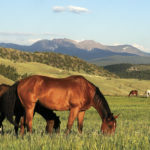 Evergreen offered the perfect location between Stapleton Airport and the ski areas, yet still had the lovely ranch pastures for raising horses. In the early 1980’s Helen was one of the first two importers of Australian Saddles into the United States. She brought four Syd Hill Australian saddles back from Australia and passed them around for people to try out. Riders were sold on their comfort for them and their horses as well as the secure seat, similar to a western saddle without the horn and weight. From there she became the Marketing Director for Australian based Wintec Saddles and again the first to bring them to North America. Around 1985, Helen and her business partner Kathryn Martin were in Calgary Canada at Spruce Meadows showcasing the Australian Saddles. Every now and then these gorgeous, smaller statured horses would fly by their booth as if on a test drive. Helen had to investigate. It turned out that they were part the fifteen Icelandic Horses that were imported from Germany to America to ride in the 3,000 mile Bicentennial Great American Horse Race – GAHR in 1976. Linda Tellington-Jones, who most of you have heard of (Tellington TTouch Training) arranged for the fifteen to be brought over and be ambassadors for the Icelandic Horse breed in the GAHR. Her sister Robyn Hood and her husband Phil Petty helped condition them in California before they were taken back to New York for the start of the race. 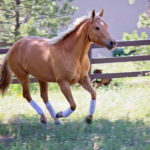 While they did incredibly well and brought much attention to the breed, the race was not managed well toward to end resulting in many horses pulling from the race. Incredibly, all fifteen of the Icelantic Horses finished the race. Some of the horses went back to owners in Germany, but Robyn Hood bought as many of them as she could and was showing them off at the famous Spruce Meadows horse venue. Helen was immediately taken with these stunning horses and eventually bought nine of them, including some from Robyn and Phil’s program. There are now just 5,000 of them in North America. With around 317,000 people in Iceland, there is about one Icelandic Horse for every 3 people. Throughout the world there is about 100,000, with 50,000 of those being in Germany. The breed has remained pure in Iceland for centuries as no other breeds are allowed to be imported since 982 AD and once an Icelandic Horse is exported, it cannot return. Icelandic Horses have the typical three gaits of many breeds with the addition of the four beat ambling Tolt and the fast two beat lateral Flying Pace which includes a moment of suspension. Not all Icelandic Horses have the additional gaits, but those that have both are considered the best of the breed. Icelandic Horses are placid, surefooted, and study easy-keepers. They have had no natural predators for over a thousand years in Iceland, so they do not have much “spook”. They were originally brought to Iceland on Viking ships to serve as the only source of transportation over Iceland’s rough terrain until the first automobile arrived in 1913. While they tend to be pony sized at 13-14 hands, they are referred to as horses. They ride like horses, they can carry up to one third of their bodyweight, not to mention the Icelandic don’t even have a word for pony. While Icelandic Horses are not typically ridden until they are four, they have an incredibly long life expectancy including being fit for breeding up to 25 years of age. They come in a variety of colors and in the Icelandic language there are over 100 different names for colors and color patterns. Their herding instinct is unrivaled. When one is sold in Iceland, they have been known to return to their original home. Helen recalled that when she first went to see them at Robyn and Phil’s farm, they are so people oriented that the horses actually fought over putting their nose in the halter and wanted to be the one that was picked to go with “the people”. Helen’s passion for these horses is unmistakable and coming from Helen, that is an endorsement to pay attention to. You would never hear this from Helen, but her friends speak of her true expertise in any venture she has taken. 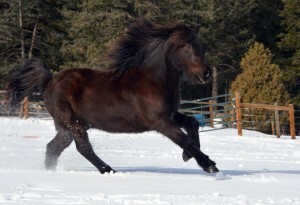 Saddles, breeding, black Arabian’s, horse care and management, and of course Icelandic Horses. Juliana Lehman, hay expert and founder of the Colorado Horsecare Foodbank, is a neighbor and long-time friend of Helen’s. Juliana said that Helen taught her everything she knows about hay. Helen has a daughter who is a well-known artist under the name of Dark Natasha and her son Lance is an Electrician in Arvada who has a one-year-old son. Heather McWilliams © 2016.